You may change the size of displayed text or turn staff client sounds on and off. These settings are specific to each workstation and stored on local hard disk. They do not affect OPAC font sizes. Select Admin → Workstation Administration → Global Font and Sound Settings. To turn off the system sounds, like the noise that happens when a patron with a block is retrieved, check the disable sound box and click Save to Disk. 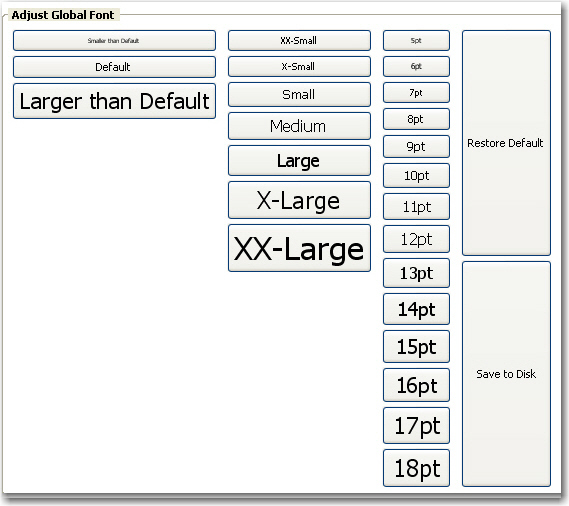 To change the size of the font, pick the desired option and click Save to Disk. It is also possible to zoom in and zoom out when viewing the OPAC in the staff client, making the font appear larger or smaller. (This will not affect other screens.) Use CTRL + + (plus sign, to zoom in), CTRL + - (minus sign, to zoom out), and CTRL + 0 (to restore default). The workstation will remember the setting.